Incorporated as a village with 115 inhabitants on December 30, 1904, as declared in the proclamation on the left, the village grew quickly. By July, 1905, the population had reached 323, making it eligible to be raised to the rank of a town. 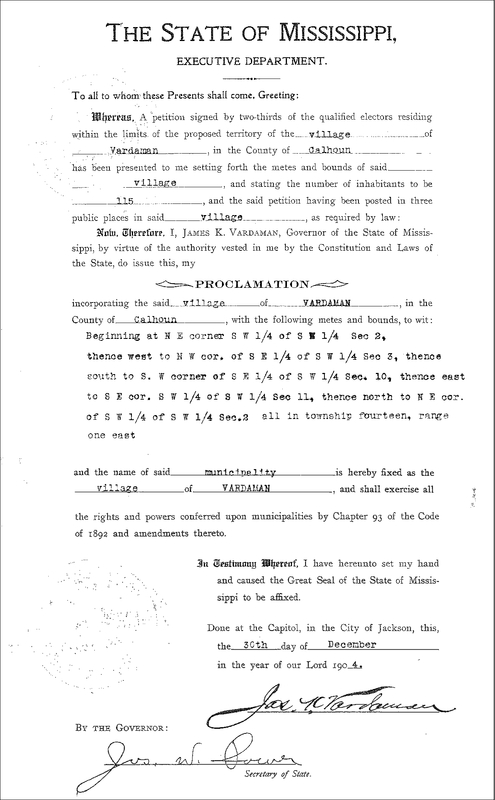 A second proclamation signed by Governor Vardaman and Joseph W. Power, Secretary of State, and recorded on August 1, 1905, stated that "Now, Therefore I Jas. 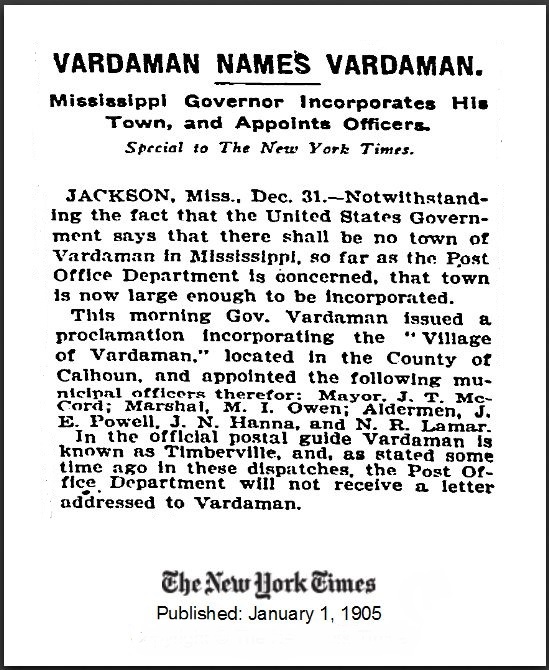 K. Vardaman, Governor of the State of Mississippi, by virtue of the authority vested in me by the Constitution and laws of the State, do issue this my Proclamation changing the name of the said Village of Vardaman to the Town of Vardaman and raising it to this second class, and it shall, from and after this date be known and designated as the Town of Vardaman and shall exercise all the rights and privileges conferred on municipalities of the second class...."
Although the village and town were named "Vardaman" from the beginning, there was a problem with using that name for the post office. When the paperwork for incorporating the village was being prepared, the usual routine request went to the Post Office Department in Washington, D.C. to give the post office at Vardaman the same name as the village. However, Governor Vardaman had powerful enemies in Washington, one of which was the United States Postmaster General, Henry Clay Payne. Mr. Payne was a Republican politician. He had been the Postmaster of Milwaukee, Wisconsin, and was a powerful and influential businessman, and he had supported Theodore Roosevelt. President Theodore Roosevelt appointed him as the Postmaster General in January 1902. James K. Vardaman edited and published a newspaper, the Commonwealth, and he used it to attack anyone who disagreed with his views. One of these was Theodore Roosevelt. 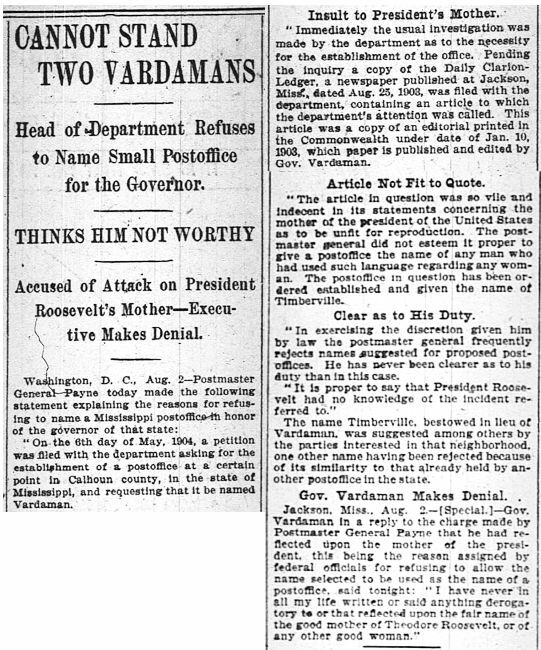 When the petition to name the postoffice "Vardaman" arrived in the Post Office Department in May 1904, the staff began the usual investigation for naming post offices and uncovered the James K. Vardaman editorials. Upon reviewing these, one in particular was the excuse for the Department's refusal to name the post office after the governor. The Department stated: "The article in question was so vile and indecent in its statements concerning the mother of the president of the United States as to be unfit for reproduction. The Postmaster General did not esteem it proper to give a postoffice the name of any man who had used such languarge regarding any woman. The postoffice in question has been ordered establsihed and given the name of Timberville." This led to the awkward need to differentiate between the two names. For example, business letterheads during this time usually stated the business name followed by "Vardaman, Miss. (P.O. Timberville)". This situation lasted until 1912. The Monitor, Pittsboro, Calhoun Co., Miss., Aug. 29, 1912, contained the information: "The daily papers last week contained a dispatch stating that the post office authorities had finally agreed to allow the name of the post office in this county known for the past several years as Timberville, located in the town of Vardaman, to be changed to Vardaman. The papers also stated that this change was due to the efforts of Congressman Sisson, who had worked long and faithfully toward this end." WASHINGTON, Aug. 23 - After tomorrow Timberville, Miss., will be known throughout the world as Vardaman, in honor of the former Governor and Senator-elect. An order changing the designation will be issued by Postmaster General Hitchcock, and it will be one of the many signs of the break between Taft and Roosevelt. Also it will be an indication of the victory won by Representative Sisson after four years of fighting. In 1908 Mr. Sisson asked to have the name changed from Timberville to Vardaman, but President Roosevelt vetoed the proposal. President Roosevelt's order requiring the name of the post office [in the town of Vardaman] to be recorded as "Timberville" was accepted by Sisson as a gage of battle and the war of correspondence which followed attracted nation-wide attention. One of the most malicious and positively little things of which Theodore Roosevelt was ever guilty - and he has been guilty of a great many - was his refusal to allow the good people of a prosperous Calhoun county community to select a name for their post office, simply and only because the people wanted to name it in honor of a man who did not love or bow down to the Great Ego. The people named their town Vardaman, but Roosevelt, with characteristic littleness, said it should not be named Vardaman, so he ignored the wishes of the people and the post office was called "Timberville." But this was another time when Roosevelt failed to recognize the determined spirit of Mississippi, so that the town, which is a prosperous one, continued to be called Vardaman, while the post office was Timberville. In accordance with the wishes of the good people of the community, Congressman T. U. Sisson took the matter up vigorously with the post office department so as to have the name of the town and the post office correspond, and allow the people to have the name that they had chosen. When the break came between Taft and Roosevelt, when the latter bolted the regular Republican nomination, Mr. Sisson was quick to see and seize his opportunity, and the post office has been change to "Vardaman" and the people of the community have at last won out.